Oh, boiled cauliflower with mayo. I could eat a whole head on my own! One of my favorite veggie dishes when I was a kid was my mom's boiled cauliflower and broccoli with brown butter. This made me very nostalgic for it–I'm eager to give boiled cauliflower a try again. It is true that these days I default to roasting! I am so glad the days of low-fat are over. This looks so delicious and easy that I'm tempted to give it a try next time life (in the form of my organic box) hands me cauliflowers. Which unfortunately isn't that common in Japan. I'll have to wait and see. Or maybe it will work with other vegetables? Melissa, this is telepathic. I solemnly swear there's a colletive cauliflower vibe going on among us cooks. I brought a huge head of cauliflower to my parents place yesterday, planning to do something with it this very morning. So indeed we made a lovely soup with said cauliflower, jerusalem artichoke, potatos and celery root. Once that was all cooked and blended, I seasoned it with salt, a touch of lemon and sugar, a bit of nutmeg and dill. Then I got here to this site looking for your chili-glazed acorn squash, and see this post. Uncanny! The reasons that make this post is a "hard sell" are exactly what make it worthwhile. I don't understand people's objection to anchovies. They're a favorite in our kitchen. Thanks for a lovely recipe! I agree with Sara on this one. I can't wait to make this! I've never had boiled cauliflower, but now its all I can think about. That and anchovy mayonnaise. Its already such a quick meal I might have to make the mayo from scratch…its my favorite kind of mayo. Oooooh that looks like one of those deceptively simple recipes. One that you can't believe can taste as good as it does. Like yourself, I've spent a lot of time in Scotland (hubby's from West Lothian) and my favourite part (by far) of the Burns Supper is the neeps. Boiled, mashed swede with butter and salt. How does it taste so good? Not a hard sell at all! I will be making this next week as soon as I buy a cauliflower, sounds perfectly marvelous to me! I agree boiled vegetables dressed in oil can be the most delicious thing on Earth, and we have all forgotten about it. And I take your point about not making veg be the punishing part of a meal. I have found out that dressing them a bit more is, as you rightly notice, way healthier in the big picture, because you eat so much less of the really dangerous stuff. I'll probably try this in one of my lunches when I'm alone, my parter does not care about cauliflower and would never eat anchovies. I can see this becoming my guilty pleasure.. It sounds great together and the garlic mayonnaise…let me count the ways I can use that one! Thank you for this beautiful post and recipe – I'm going to make this tonight! I find its hard to be really creative with vegetables day in day out – I tend to make a lot of salads – but this cauliflower looks delicious and easy to make. This sounds really good, but roasted cauliflower is one of the best things ever, and would probably go equally well with the mayo. Perhaps a mixed plate of the two would be the perfect solution to the problem! You can steam vegetables to the same degree of silken doneness and preserve most of the nutrients that would be lost in boiled water. That's 80's diet wisdom for ya! Boiled vegetables are the healthiest! And the anchovy-caper mayo seems to complement it well! What other anchovy alternatives can I use? We're not big fans of anchovies. But I want to try this recipe! I love veggies whatever way they might be cooked. I just love all the different things one can do with them. And the color is just amazingly appetizing. 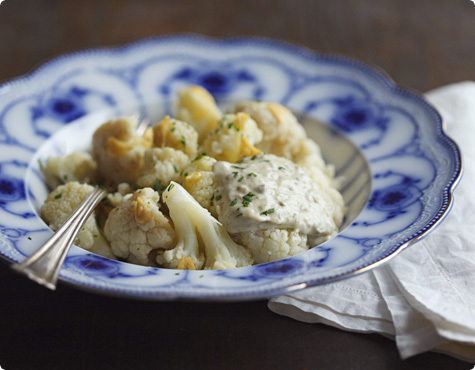 Cauliflower and garlic is a favorite at family dinners. Because of the mayonnaise, we don't make it very often, because, it's hard to stop eating it! !To those who are opposed to boiling, we do our recipe by steaming. We also use a lot more garlic, which becomes quite mellow when mixed together warm.This is my story of how I learned about a very similar dish:http://icookforleftovers.wordpress.com/2012/05/31/garlicky-cauliflower/It's a dish I think many would enjoy, but so few know about. Hi, I have a bag of broccoli florets that I desperately need to use and some artisan bread in the crock pot right now. Do you think this recipe would translate well to broccoli?Cheers!